The Institute of American Indian Arts Archives has completed the arrangement, description, preservation and digital imaging of the Taos Pueblo artist Merina Lujan Hopkins (Pop Chalee) Papers, funded by a grant from the New Mexico Historical Records Advisory Board, an IAIA press release states. The post Pop Chalee Collection Preserved by IAIA appeared first on Tribal College Journal of American Indian Higher Education. Lac Courte Oreilles Ojibwa Community College graduates were honored with diplomas and other awards at the Class of 2018 commencement Thursday, May 17, at the Sevenwinds Casino event center. The post 32 Earn Associate Degrees at LCO College appeared first on Tribal College Journal of American Indian Higher Education. A new partnership between Diné College and the Department of Homeland Security (DHS) will research factors that cause the spread of violent crime in the United States. 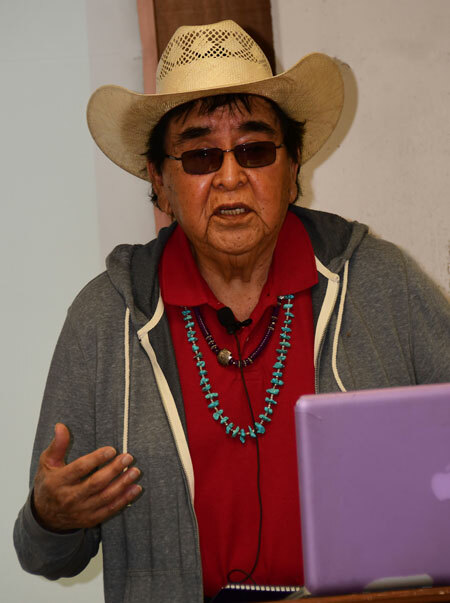 The post Diné College Chosen for Virginia-Based Research Project appeared first on Tribal College Journal of American Indian Higher Education. A postsecondary degree for the American Indian and Alaskan Native (AIAN) populations increases employment rates and labor force participation but reaps smaller gains in earnings compared to their white counterparts. The post Higher Education for American Indian and Alaskan Natives Increases Employment Rate But Does Not Close Earnings Gap appeared first on Tribal College Journal of American Indian Higher Education. Celina Gray, a Salish Kootenai College student, has been awarded the $5000 George Lea Founders Scholarship provided by the Public Lands Foundation. Gray, majoring in wildlife and fisheries biology, will begin her senior year in the fall of 2018. The post Salish Kootenai College Student Awarded George Lea Founders Scholarship appeared first on Tribal College Journal of American Indian Higher Education. More than 80 respected leaders from tribal colleges, Alaskan Native-serving and Native Hawaiian-serving institutions from across the U.S. attended the forum. The post UH Hosts National Science Foundation Tribal College and University Leaders appeared first on Tribal College Journal of American Indian Higher Education. In the wake of the incident, the Marymount California University has issued a formal statement and the MCU President has apologized to Rojas. The post Video of Cherokee Student Detained at Marymount College for Showing Tribal ID Goes Viral appeared first on Tribal College Journal of American Indian Higher Education. Salish Kootenai College hosted its annual Powwow and graduate honoring last week at the Joe McDonald Health and Wellness Center. Friday’s opening was lead by the Veteran’s Warrior Society who carried US, Canada, and Confederated Salish Kootenai tribal flags. The post Salish Kootenai College Powwow Celebrates Graduates, Education appeared first on Tribal College Journal of American Indian Higher Education. Founded in 1880 as Indian University, Bacone College is affiliated with the American Baptist Church of the United States and is located on land donated by the Muscogee (Creek) Nation. Since 2010, it has been the accreditation partner for Pawnee Nation College, one of Oklahoma’s two remaining tribal colleges. The post New Bacone President Approaches Tribes for Funding appeared first on Tribal College Journal of American Indian Higher Education. The solar arrays will next be installed on the other Twin Eagle building—Red Lake Nation College—followed by the three Seven Clans Casinos at Red Lake, Thief River Falls, and Warroad. The post Solar Panels Installed at Red Lake Government Center appeared first on Tribal College Journal of American Indian Higher Education. The funding covers workforce training for Colstrip and other communities in Eastern Montana affected by coal-related layoffs, including the Northern Cheyenne, Crow, and Fort Peck Assiniboine & Sioux reservations. The post Colstrip Awarded Nearly $1 Million Grant for Workforce Planning and Worker Training appeared first on Tribal College Journal of American Indian Higher Education. The post Navajo Technical University Has a Lot to Celebrate at Its 2018 Spring Commencement appeared first on Tribal College Journal of American Indian Higher Education. The post Diné College Graduates 190 Students; 31 Earn Bachelor’s Degrees appeared first on Tribal College Journal of American Indian Higher Education. The recent incident of racial profiling and harassment of two Native students at Colorado State University is a wakeup call to be active in working towards a safer, more inclusive society. The post A Call to Action appeared first on Tribal College Journal of American Indian Higher Education. The post Career Educator Proud of Alma Mater, Diné College appeared first on Tribal College Journal of American Indian Higher Education. The post What Nonprofit Higher Ed Must Learn from Colorado State’s Racial Profiling Incident appeared first on Tribal College Journal of American Indian Higher Education. Colorado State University is taking a barrage of flak after two Native American students who'd signed up to tour the campus were detained by police after the mother of another potential CSU attendee dialed 911 because their appearance disturbed her. The post CSU Rousting Native Students on Tour Is All Too Typical, Advocate Says appeared first on Tribal College Journal of American Indian Higher Education. Bacone College, a private college located in Muskogee, Oklahoma that is affiliated with the American Baptist Churches USA and serves as accreditation partner for Pawnee Nation College, announced on Tuesday that it will be suspending operations beginning Monday due to major financial shortfalls. The post Bacone College Closure Impacts Pawnee Nation College; Students Warned to Get Transcripts ASAP appeared first on Tribal College Journal of American Indian Higher Education. As the 2018 spring semester concludes at Navajo Technical University, 11 welding technology majors will earn their certification with the American Welding Society (AWS), proving their competence in the highest industry standards for professional welders. The post NTU Welding Technology Program Certifies Students with the American Welding Society appeared first on Tribal College Journal of American Indian Higher Education. The Cultivating Resources, Opportunity, Prosperity and Sustainability (CROPS) for Indian Country Act (S. 2804) would authorize tribes to exercise greater self-governance for U.S. Department of Agriculture (USDA) programs, such as forestry and nutrition, and update several other key USDA authorizations to better serve Tribes. The post Hoeven, Udall Introduce Legislation to Support Native Farmers, Ranchers, and Communities appeared first on Tribal College Journal of American Indian Higher Education.